This website is a basic guide to growing lettuce. We’ve tried to orient this site to more natural ways of gardening. This includes composting and using organic and natural gardening products instead of chemicals. We feel that growing your garden naturally is best for your family and for the environment. Natural gardening is especially important when you grow food crops like lettuce. After all, you’re going to eat the lettuce you produce, so why would you want to use lots of potentially harmful chemicals on your plants? If you do use chemical fertilizers and pesticides to you grow your lettuce, just make sure to read the package instructions very carefully before applying them. 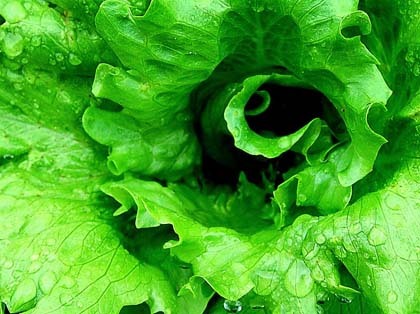 Lettuce grows well under cooler conditions and needs plenty of water. If you plant your lettuce when low temperatures are around 40 degrees F and high temperatures are around 60 degrees F, your lettuce should do fine. Be aware that a hard freeze will still damage your lettuce. However, lettuce can survive light freezes, so not to worry. This makes lettuce an ideal crop to grow either during the fall or the early spring. Keep reading more for specific tips on how to grow great lettuce. Keep reading for more information, and happy lettuce gardening!